For those Bills fans making the road trip to Cincinnati for the game this weekend, you might be interested in stopping in Canton on your way there at the Pro Football Hall of Fame. Here’s why. Any Bills or Bengals fan dressed in their team’s gear who mentions the promotion at the Hall’s box office will receive a $5 discount on any regular price museum admission. The promotion runs from Friday, Nov. 18 through Monday, Nov. 21. The Hall of Fame is open from 9 a.m. to 5 p.m. daily. Information about planning a visit to the Hall of Fame can be found at: www.ProFootballHOF.com/visit/. The Bills take on the Bengals this Sunday at 1:00 p.m. at Paul Brown Stadium. The Ralph C. Wilson Jr. Foundation has provided a sizable grant to the Pro Football Hall of Fame. The Hall announced on Wednesday that they are the recipient of a $2.5 million grant from the Wilson Foundation earmarked for a variety of Hall of Fame programs and projects. Among the projects is a dramatic holographic theater experience concentrating on the values learned from the game. Other initiatives funded by the grant include the digitization of the Hall of Fame archives that will focus on developing a comprehensive digital archive for every NFL player past and present. Also, $1 million of the grant will be set aside to create an endowment to support Hall of Fame programs on an annual basis. 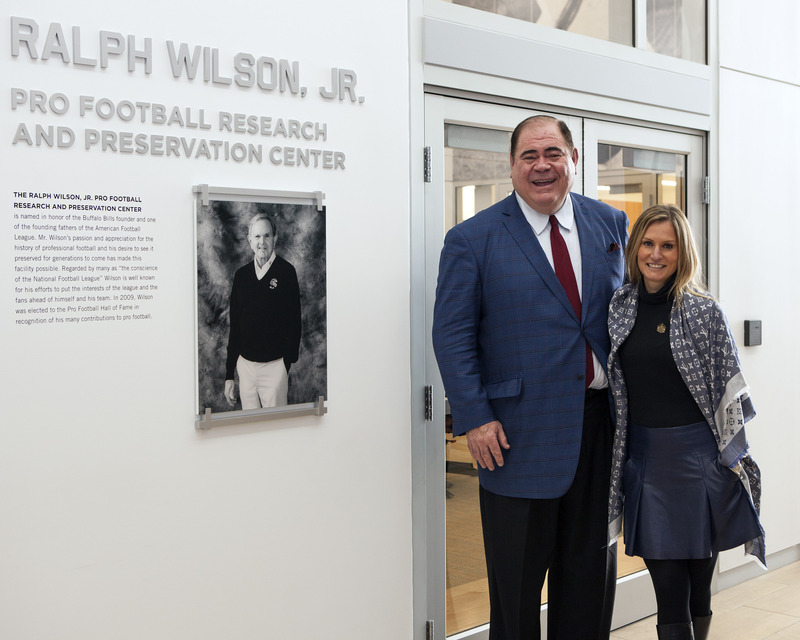 Wilson Foundation Executive Vice President and Life Trustee Mary Owen was joined by Hall of Fame President David Baker Wednesday at the Hall of Fame to make the announcement. The Ralph Wilson, Jr. Pro Football Research & Preservation Center was dedicated in August 2012 and today the state-of-the-art archive is home to more than 30 million pages of documents and five million photographic images. He’s never been a Pro Football Hall of Fame semifinalist let along a finalist, but Bills Wall of Famer Kent Hull was a pretty important cog in Buffalo’s four consecutive AFC title teams. Respected columnist Rick Gosselin took a stab at making the case for late Kent Hull recently for more Hall of Fame consideration. Part of his argument centered around how important he was in helping the K-Gun offense operate. While Jim Kelly called the plays, Hull set up the blocking schemes on the fly to help make the breakneck pace of the offense possible. He also was a pretty darn good player. Gosselin is also realistic in describing how the teams that don’t win the Super Bowl often find it more difficult to see players get enshrined, even if they are deserving. There’s a very strong likelihood that the best chance for Hull might be as a Senior Committee nominee several years down the road, much like this year’s Senior Committe nominee, Mick Tingelhoff, a center as well on a very successful Minnesota club that won 10 division titles in 11 seasons and also appeared in four Super Bowls, and lost all of them. Former Bills general manager Bill Polian has been named as one of two Contributor finalists for the Pro Football Hall of Fame Class of 2015. Polian along with former NFL GM Ron Wolf were chosen by the Hall of Fame’s Contributor Committee that met in Washington, D.C. Wednesday. “It’s an incredible honor that I never envisioned happening,” Polian said. Polian and Wolf will join senior nominee Mick Tingelhoff and 15 yet-to-be-named Modern Era finalists from which the Class of 2015 will be selected. The Pro Football Hall of Fame’s selection meeting will be held on Jan. 31, 2015, in Phoenix, Arizona, the day before Super Bowl XLIX. Tingelhoff was the nominee of the Seniors Committee that met in Canton in August. Polian is most noted for turning the fortunes of three different teams that included a combined five Super Bowl appearances by the Buffalo Bills and Indianapolis Colts. He guided the Bills to four straight AFC Eastern Division titles and earned three straight Super Bowl berths after winning the AFC championship in 1990-92. As the general manager of the expansion Carolina Panthers, he helped build a team that advanced to the NFC championship in just its second season. Polian next served as President/General Manager of the Indianapolis Colts from 1998-2011 during which time the club captured eight division crowns and advanced to a pair of Super Bowls including a win over the Chicago Bears in Super Bowl XLI. In all he had a 32-year NFL career with the Kansas City Chiefs (1978-1982), Buffalo (1984-1992), Carolina (1995-97), and Indianapolis (1998-2011). He also worked for the National Football League office in 1993 and 1994. Wolf made his lasting mark as the Executive Vice President/General Manager of the Green Bay Packers and longtime player personnel director for the Oakland/Los Angeles Raiders. There were a host of former Bills players and coaches on the Pro Football HOF nominee list released this week. There were 113 nominees in all. Here’s a look at the names with Bills ties. In his Hall of Fame acceptance speech last Saturday night Bills all-time leading receiver Andre Reed mentioned former Bills GM Bill Polian and indicated that he too would soon be in the Hall of Fame. Reed perhaps knew something that others may not have known as the Pro Football Hall of Fame has altered their bylaws making the chances of enshrinement for Polian far greater now than ever before. On Wednesday the Board of Trustees of the Pro Football Hall of Fame formally announced changes to the organization’s By-Laws for the Selection Committee. They approved a modification to the selection process by which a Contributor – defined as an individual who has “made outstanding contributions to professional football in capacities other than playing or coaching” – will automatically be included among the annual list of finalists for election. The Contributor finalist will also be voted on for election independent of all other finalists. The change to the By-Laws was approved at the Board’s annual meeting last Friday in Canton. Although the Contributor finalist will be voted on independent of the other nominees, he will still be required – like all other finalists – to receive an eighty percent positive vote for election by the 46-member Selection Committee. The Board, in an effort to address the backlog of deserving Contributor candidates, also approved a temporary measure allowing for two Contributor finalists in years one, three and five, of the next five years. In years two and four of that same period, there will be just one Contributor finalist. At the end of the five-year period, the number of Contributor finalists going forward will be one per year. Buffalobills.com talked to Hall of Fame Selector Committee member Jarrett Bell of USA Today, who told of the committee’s lobbying efforts to separate contributors (coaches, owners, commissioners, GMs etc.) from players. Now that it has happened Bell believes it will help in two ways. It will also keep contributors from serving as roadblocks to deserving players as was the case with Andre Reed when Ed Sabol, Bills Parcells and the late Ralph Wilson earned induction over the last eight years forcing Reed to wait until 2014 for enshrinement.